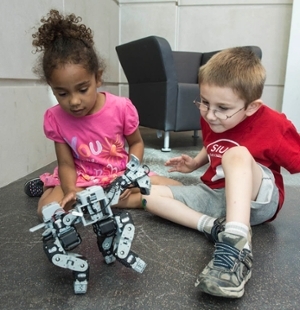 Educators at Southern Illinois University Edwardsville believe it’s never too early to begin learning about science, technology, engineering, arts and mathematics (STEAM). That is why the SIUE Early Childhood Center (ECC) is co-hosting a second Early Childhood STEAM Conference for educators of young children on Monday, Sept. 19. The conference will be held from 8 a.m.-4:30 p.m. in the Morris University Center. The SIUE Early Childhood Center and the Early Childhood Education Program in the School of Education, Health and Human Behavior are presenting the conference in partnership with the Illinois Early Childhood Center of Professional Development and Spaces for Play, Inc. The conference features internationally recognized keynote speakers, Toni and Robin Christie of New Zealand. The Christies will address the opportunities early childhood educators have to support children’s learning of STEAM. “The conference gives us a great opportunity to showcase the exemplary early childhood programs we have at the University and the amazing resources the University has to offer educators,” said Rebecca Dabbs MacLean, ECC director. The conference also includes multiple workshop sessions. “We are very proud that we have brought together an exemplary group of educators to lead the breakout sessions,” said MacLean. The conference costs $50 per person and includes resources materials and lunch. Participants will be credited with seven hours of professional development. Click here to register. For more information, contact the ECC at 650-2556. Early Childhood Center students learn about robotics.